MARTIN O’NEILL has defended Roy Keane in the wake of reports that the Ireland assistant had heated confrontations with both Jon Walters and Harry Arter before Ireland’s friendly against France back in May. On Monday morning, a voice message surfaced on social media detailing Keane’s fall-outs with Walters and Arter prior to the summer friendly against France. Arter has recently made himself unavailable for selection, with O’Neill refusing to deny that the altercation could have played a part in his decision. The Ireland boss, however, said that Keane had been a reliable assistant during the pair’s tenure over the last five years since taking over in 2013. “In my time as a club manager, I’ve chosen two brilliant, brilliant assistant managers — John Robertson and the young man himself Roy Keane,” said O’Neill. “I’ve chosen them particularly and, at the end of it all, none of them have ever let me down. I’ll take the responsibility for it at the end of the day, because that’s my job. 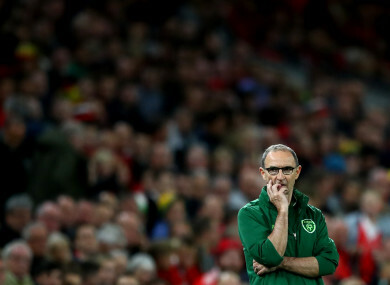 The manager admitted that Ireland were going through a difficult period, with Thursday’s 4-1 Nations League defeat against Wales coming 10 months after hopes of qualifying for the World Cup were dashed 5-1 by Denmark in Dublin. However, he stated that revelations of confrontations within the Irish camp were not issues his side were struggling with at the moment. We’re going through a bit of a stodgy period,” he said speaking three days after defeat in Cardiff. “We’re trying to get young players through at this minute. I’ve capped innumerable players at this minute, just to try and get us prepared for this European Championship coming up. O’Neill denied that morale within the Irish squad was being affected, stating that results at the European Championships in France two years ago and Ireland’s passage to the play-offs of the World Cup were evidence of a strong collective. “We were second best in the game [against Wales]. The minute you lose a football match — and we were well beaten — I think everything is then questioned at the end of it. But in terms of morale, I couldn’t disagree more. I do need to emphasise this again: we could not have reached the Euros and perform in the manner in which we did, we could not have gone from fourth seeds to a World Cup play-off against Denmark, with poor morale in the camp. Ireland take on Poland at the Municipal Stadium in Wrocław tomorrow evening looking to bounce back from Thursday’s sobering defeat against Ryan Giggs’ side. Captain Seamus Coleman has been ruled out and joins a growing list of absentees which includes James McClean, Robbie Brady, Sean Maguire and Stephen Ward, Jon Walters, Alan Browne and Shane Long. Email “O'Neill: 'Roy Keane has never let me down. I'll take responsibility, because that's my job'”. Feedback on “O'Neill: 'Roy Keane has never let me down. I'll take responsibility, because that's my job'”.